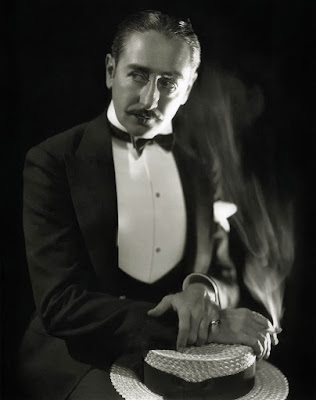 I'm continuing my Summer Under the Stars celebration with the debonair Adolphe Menjou. TCM is celebrating the career of Adolphe Menjou with 15 movies on Aug. 3. Here's what you need to know about the actor who was billed as "America's best dressed man." Born: Feb. 18, 1890, in Pittsburgh. Died: Oct. 29, 1963, in Beverly Hills, Calif. He is buried in the Hollywood Forever Cemetery. Academy Awards: Nominated for Best Actor for The Front Page (1931). Brief bio: Menjou was raised in Pittsburgh by his immigrant parents (His father was French; his mother, Irish). He earned an engineering degree from Cornell, but Menjou was always interested in acting. 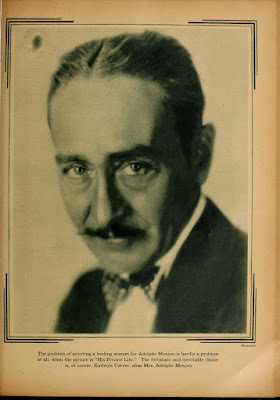 He pursued a career in silent films after serving in the U.S. Army ambulance service during World War I. Menjou got his big break opposite Rudolph Valentino in the Sheik (1921) and he became a popular leading man in his own right in films like The Three Musketeers (1921) and A Woman of Paris (1923). Menjou was one of the great romantic leading men of pre-code talkies and he aged gracefully into substantial character parts like his role as a philandering theatrical producer in Stage Door (1937). Menjou's last film role was as the recluse Mr. Pendergast in Pollyanna (1960). 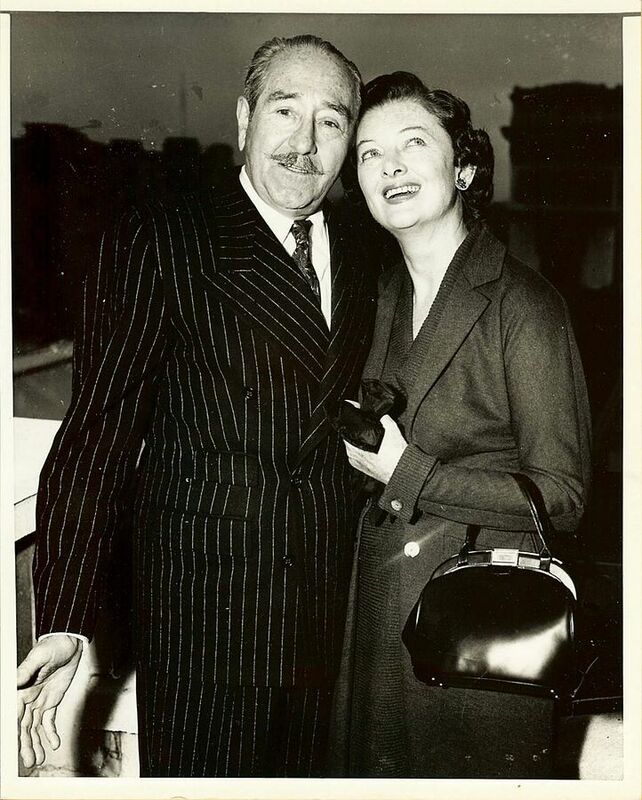 Adolphe Menjou and Myrna Loy during the publicity tour for The Ambassador's Daughter (1956). Fun fact: Little Miss Marker (1934) is one of Menjou's most delightful films, but he wasn't thrilled with co-star Shirley Temple. He referred to the pint-sized sensation as a "6-year-old Ethel Barrymore" who was "making a stooge out of me." Signature role: The wordly, well-dressed businessman Pierre Revel in A Woman of Paris. This movie is airing at 7:30 a.m.
1. Stage Door, airing at 11:15 p.m. is one of my favorite films of the 1930's, and Menjou is great as a theatrical impresario who has more than a professional interest in Katharine Hepburn. 2. The Harold Lloyd comedy The Milky Way (1936), airing at 1 p.m., is another personal favorite. Menjou plays a crooked boxing manager who promotes a timid milkman (Lloyd) who has a killer swing. 3. The Tall Target, airing at 3 a.m., is an underrated historical thriller directed by Anthony Mann about a detective's attempts to save Abraham Lincoln from assassination. Menjou plays a colonel who doesn't believe the threats are real. A great film not featured on Summer Under the Stars: Menjou, a World War I veteran himself, is quite good in Stanley Kubrick's anti-war drama Paths of Glory (1957) as a French general who sends a group of soldiers on a suicide mission. Fan magazine flashback: A 1928 portrait of Menjou from Motion Picture Magazine. Courtesy of the Media History Digital Library. Video: This video shows you why Menjou was billed as "the best dressed man in America." Menjou co-starred with Barbara Stanwyck and William Holden in the 1939 boxing classic, Golden Boy. For more Summer Under the Stars articles, go here. There'll be plenty more on Menjou on social media. Follow me on Tumblr, Google+ or Pinterest or like us on Facebook. Follow us on Twitter @oldhollywood21.